Catherine Duso approached us with the desire to develop a distinctive web presence for her Toronto-based hand made jewelry company, Citrine Creations. She knew what information she wanted to provide her customers, but left all design and functional considerations up to us. Based on the information she gave us, we developed several unique designs for her to consider. After she selected a design, we used that as the starting point for development of the actual site. The final design uses the beauty of the jewelry itself as the main focal point for the visitor. Product pages are laid out to give maximum emphasis to the design of each piece, with little distraction from the surrounding elements. 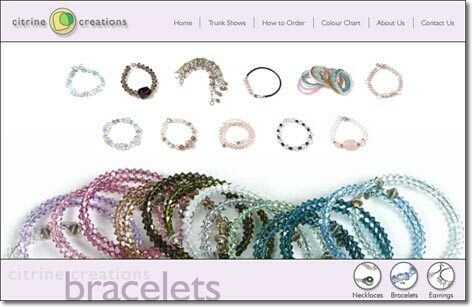 Navigation is clear and simple, and all colours are coordinated with the jewelry. Click here to visit the site. "It was a pleasure working with Kenneth Young Design. I came to them with the basic outline of what I was looking for and they helped shape those ideas into a great website. They knew the difference between what could be done and what should be done, clearly explaining the options available and which options would be best given my goals and budget. They were extremely knowledgeable and helpful—they even helped us with photography issues. I look forward to working with them again!" We recently added e-commerce functionality to the website through the use of a PayPal shopping cart system. This system is ideal for small to medium-sized businesses as it allows rapid development of a cost-effective, secure online sales system for a limited product inventory. We also designed a sales brochure for in-store distribution. This sheet was designed with a simple, elegant external appearance, contrasted with the very colourful, high-impact internal appearance. This had the effect of drawing the reader into opening the brochure, then engaging them with attractively arranged and interesting pieces of jewelry. Looking for professional, cost effective design services? Contact us for a free quote. With the trend towards selling products and services online, many business are eager to jump into the fray. However, there are many factors to consider that may not be obvious even to experienced business owners. Online credit card processing is one of the most confusing aspects of e-commerce. Businesses with a merchant account do not necessarily qualify for an internet merchant account, and even if they do, there are significant software and setup costs involved in processing your own credit card transactions. Various third-party payment processors exist, each with their own benefits and drawbacks including ease of setup, processing fees, likelyhood of fraud, and other considerations. E-commerce software is often very expensive, and buying a custom or pre-made package might not alwyas be the best option. There are several free, feature-packed e-commerce solutions available that might be easily customized for your company, saving you thousands of dollars over pre-packaged solutions or solutions built from scratch. If you want to sell online, we can guide you through the confusing decisions to help you find the solution that's right for you. Contact us for a free quote.